Adding a pergola to your outdoor living space in the Minneapolis, Minnesota, area can transform your underutilized backyard into a private retreat where you can enjoy nature and the company of loved ones. 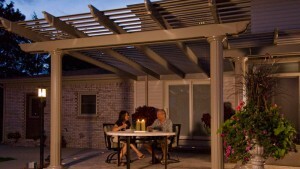 For a top-of-the-line pergola and expert installation services, trust the professionals at U.S. Patio Systems and Home Remodeling. We sell and install highly sought-after TEMO pergolas, which means you can count on them to be both beautiful and long-lasting. Durability – Your new pergola will be made of heavy-duty extruded aluminum that won’t warp, fade, crack, or become infested with insects. This means that you will get to spend more time enjoying your new shade solution instead of worrying about its upkeep. Low-maintenance – Our pergolas are electrostatically treated, which means they are virtually maintenance-free. Extra sun protection – The curved lattices we use offer extra sun protection, so you can enjoy even more shade. Customizable options – Choose from our attached, freestanding, and garden arbor pergolas to find a style that perfectly complements your home. For more information on adding a pergola to your home and to learn more about the installation services we offer, contact U.S. Patio Systems and Home Remodeling today. Our team of specialists is available to answer any questions that you might have.